Enjoy a science-based, slightly academic, wholly entertaining celebration of the season's most maligned sweet – the fruitcake – now through Friday at the Science Museum of Virginia. The Science Museum of Virginia continues its annual tradition of experimenting on everyone’s least favorite holiday treat – the fruitcake. Now through Friday, December 20, Museum educators will put the maligned pastry through unconventional and explosive experiments during Fruitcake Science. New this year, guests can see two special fruitcakes: a fruitcake that launched to space and back; and a fruitcake that traveled directly from Buckingham Palace. 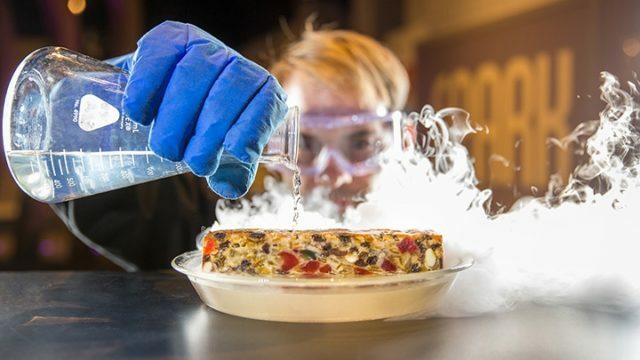 After seeing the celebrity pastries, guests can watch as other fruitcakes undergo the rigors of scientific testing – from being launched out of a trebuchet and getting tossed down a stairwell to battling a blowtorch and dropping down to negative 321 degrees with liquid nitrogen. Museum guests are invited to participate in action-packed live science demonstrations including fan favorites from years past, and enjoy a few new surprises as well during Fruitcake Science. Fruitcake Science is included with exhibit admission. Tickets are $14 with $1 discounts for ages 4 to 12 and 60+. For more information visit www.smv.org.